It makes so easy and so quick if you used an Excel Spreadsheet when you are couponing. It will automatically add, subtract and multiply even get the percentage tax before you go to the store. 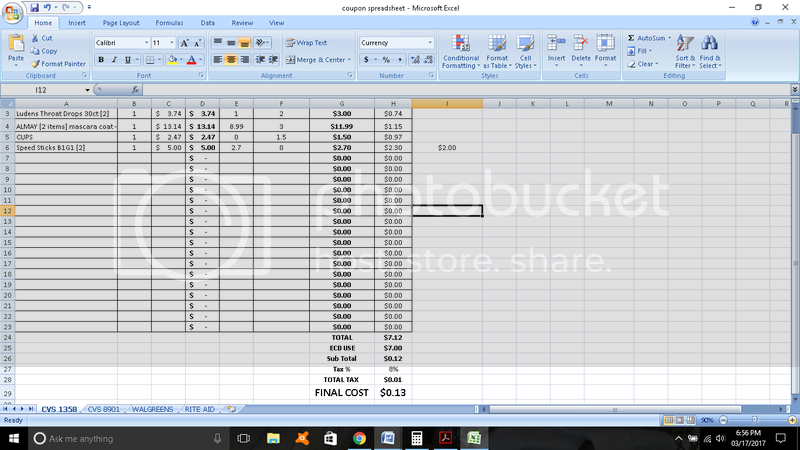 I was motivated to create my own Couponing Spread Sheet with the help of a Microsoft Excel software. It doesn’t matter what version do you have because the formula that is used is pretty much the same and can be applied to the Excel. Before I finalized my own spreadsheet, I need to refresh my memory and the studies I’ve been through during my College Days in Computer Science. YES! I earn a Bachelor Degree in Computer Science, however, I never really used the knowledge that I studied after graduation. That’s because I got hired in my Alma Mater months before I graduate and being a former Secretary to the Vice President for Academics in a now University school, my programming skills didn’t really applied. It was also my fault that I did not continue and further my programming studies. However, the other bright side of it is that I did apply the other advanced knowledge on software and hardware troubleshooting. Anyways, let’s go back about me finally using a spreadsheet after months and months of couponing. I realized and motivated from one of the couponers how neat her groceries and organized each item. This way, I would know exactly how much do I need to pay at the cashier, rather than cramming at the last minute. Now, provided that all the items are in stock. We all know that it’s pretty common, that most extreme couponers clear shelves, and the rest who wanted to get the deal won’t be able to get it. Unless, they asked for a rain check. After working with a simple and user-friendly formula, I have finally created and will be able to use this while I’m in the store. I can’t wait to use this tomorrow while I get some stuff, more likely a money maker or items lesser than a retail price. After the end of the day, I know the exact amount I’ll be spending or using provided that all the items and the quantity is available. It would be easier for me to relax and browse online more about Guitar Center, traveler guitar.